If you’re like me, then one of the most difficult things about exercise is that it can become a tad bit boring. Even walking with an MP3 player attached to my ear at all times has become a little routine and there are very few exercises which provide entertainment at the same time. Exercising on a stationary bike has become a popular workout, but previously, there was only one way to be entertained while riding a stationary bike and that was to move the bike in front of the television. I have personally walked into several homes over the years and saw exercise equipment and bikes parked in front of televisions and to be honest, it’s quite space consuming. Luckily, there is a new trend in stationary bikes that enables riders to enjoy an entertaining workout and the technology for this is built right into the bike itself. It’s called the Expresso Bike and it is paving the way for exercise equipment to have interactive functions built into the equipment that provides users with endless hours of entertainment. The Expresso Bike provides riders with interactive courses that take them through virtual trails and courses where they can compete against other riders. This makes it riding the stationary bike feel like more of a challenge and therefore it can get riders ramped up and in a competitive mind state. 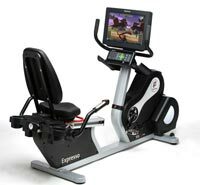 The Expresso Bike is made by Expresso Fitness and it also comes in a youth version as well for adolescent riders. Along with providing interactive trails and courses for exercisers, the bike also allows riders to watch television on the screen and also listen to music of their choice. This way, there are no more space issues with stationary bikes taking up the majority of space in living rooms and family rooms across the country. The only downfall to the Expresso Bike seems to be the price tag, as this exercise equipment does not come cheaply. Online exercise equipment retailers are selling the adult version of the bike for over $5,000. While this seems like a steep price to pay for the ability to interact with the machine and receive a few different entertainment options, trends show that people are willing to pay for fitness and exercise equipment that takes the boring out of exercising. Matt, it really depends on your goals. A lower intensity workout tends to burn more fat while a higher intensity workout is better at strengthening your cardiovascular system. I am looking for the best technique. Is it better to use a lower gear or go your hardest in the highest gear? Gear 30, the highest, doesn’t seem too hard….but would it be better going on gear 25 my hardest ?